We’ve received many compliments on our store layout, quality of merchandise and affordable pricing. In an effort to provide an even better shopping experience, we will be installing new clothing display racks, counters and shelves during the week of April 15th. We appreciate your patience, and look forward to seeing you again when the work is done. We might finish early, but we will definitely be open for business again Tuesday, April 23rd! 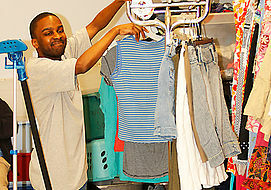 To provide vocational training opportunities for adults with autism by giving them real life retail experience. Providing long term career opportunities by partnering with local businesses. Going Full Circle is a 501(c)(3) public charity. 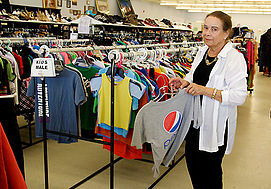 We are a fully functioning thrift store with training facilities for adults with autism. All vocational training will be conducted by Nicole Poitras. Nicole, CEO of Going Full Circle, has a Master’s Degree from the University of South Florida in Autism and Low Incidence Disabilities. She is a teacher of students with autism and has been working with individuals with special needs for thirteen years. She was awarded the Autism Teacher of the Year Award by the North Carolina Autism Society in 2010.